Simple, rhyming text provides good practice for easy reading. This story was a favorite of our four children for many years!If you don't know it, check it out! Papa Bear is an impetuousfellow. 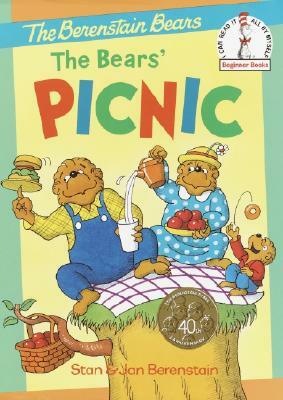 In this humorous and beautifully illustrated poem, he promises to take Mother Bear and their son "to the very best place in the world" for a picnic. The poem nicely lays out many examples of stalled thinking, and will encourage youngsters reading the book to check out their assumptions before they leap. Papa Bear actually has a spot in mind where he and Mother Bear used to go. The only problem is . . . there's a smoky train that goes by that formerly idyllic spot now. Unwilling to admit that he may have been subject to the tradition stall (believing that things are unchangingly perfect), he charges off to try again. Before the Bear family is done, they will have found a big picnic full of other rowdy animals, mosquitos, trash in a dump, an airplane glide path, rain, and dangerous lightning. Sure enough, they trudge home . . . and have their picnic on their dining room table. Which is a round about way of saying that there's no place like home. Children will learn to question authority as well, having seen that Papa Bear can be so wrong. These are a lot of good lessons in one short, enjoyable book. Overcome your stalled thinking about how soon your children can start to improve their thinking with this book!